I think I now have a way that might help students to get conceptually understand what’s going on. I only had the insight 10 minutes ago so I’m going to use this blogpost to see if I can’t get the ideas straight in my head… The point of this post is not to share a way I’ve made the chain rule understandable. It’s for me to work through some unformed ideas. I am not yet sure if I have a way to turn this into something that my kids will understand. So here’s where I’m starting from. Every “nice” function (and those are the functions we’re dealing with) is basically like an infinite number of little line segments connected together. Thus, when we take a derivative, we’re pretty much just asking “what’s the slope of the little line segment at ?” for example. Now here’s the magic. In my class, we’ve learned that whatever transformations a function undergoes, the tangent line undergoes the same transformations! If you want to see that, you can check it out here. For a quick example, let’s look at and . We see that is secretly which has undergone a vertical stretch of 2, a horizontal shrink of 1/5, and has been moved up 1. Let’s look at the tangent line to at . It is approximately . The whole point of this is to show that tangent lines undergo the same transformations as the functions — because the functions themselves are pretty much just a bunch of these infinitely tiny tangent line segments all connected together! So it would actually be weird if the tangent lines didn’t behave like the functions. So why not look at function composition in the same way? We can look at a composition of functions at a point as simply a composition of these little line segments. Let’s see if I can’t clear this up by making it concrete with an example. And so we can be super concrete, let’s try to find , which is simply the slope of the tangent line of at . I’m going to argue that just as and are composed to get our final function, we can compose the tangent lines to these two functions to get the final tangent line at . Now let’s start with the square root function. We have to be thoughtful about this. We are dealing with which really means that we’re taking the square root of 9. We we want the tangent line to at . That turns out to be (again, trust me?): . So now we have our two line segments. We have to compose them. Where did we ultimately get the slope of 2 from? When we composed to two lines together, we multiplied the slope of the inner function (12) by the slope of the outer function (1/6). And that became our new line’s slope. For any composition of functions, we are going to have an inner and an outer function. Let’s write where we can clearly remember which one is the inner and which one is the outer functions. Let’s pick a point where we want to find the derivative. We are going to have to find the little line segment of the inner function and compose that with the little line segment of the outer function, both at . That will approximate the function at . I am going to keep those terms blah1 and blah2 only because we won’t really need them. Let’s remember we only want the derivative (the slope of the tangent line), not the tangent line itself. So our task becomes easier. If your students are comfortable with the idea of transforming a function transforming the tangent line, then it would seem like you could follow that quite smoothly by composition of functions of tangent lines. Although, I will say that I did have to read through this twice before I made real sense of it and the example was essential. This is getting close to the way I understand the chain rule best. Of course, the algebra will work out the same, but the mental model for “functions and their derivatives” I use here is a bit different. I tried sharing this with the last Calc 1 class I taught. I don’t think that it worked for those students, but it was a challenging bunch. I am convinced this _can_ help. So, maybe you want to try it. Instead of using graphs to visualize functions, think of a diagram with a separate line for each of the domain and the range of your function. Then a function is a way to associate points in the domain copy of the line with points in the range copy of your line. As a schematic, I draw two line segments, both horizontally, with an arrow curving from the one on the left (domain) up-over-and-down to the one on the right (range). f'(a) = “infinitesimal stretch factor modeling behavior of f from points near a to points near f(a)” Note that this is describing how you stretch or shrink one piece of a line to make it match up with the other line. Anyway, this is how I understand the chain rule. Oooh you mean like http://www.mathedpage.org/func-diag/#composition? I like this idea so so so much. Uh, yeah. My pictures are not exactly those, but close enough for these purposes. Interesting as usual. I really like the approach suggested by TJ and your diagrams in the linked post. The inner function stretches or shrinks (and translates) a small interval in the domain to another small interval in the range. 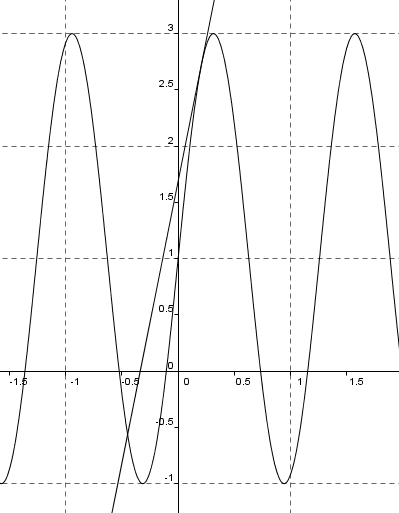 The outer function then further stretches or shrinks (and translates) this interval. The combined stretching/shrinking is the product of the two factors (slopes). This geogebra applet shows graphs for the inner, outer, composition, and relevant small intervals all at once. 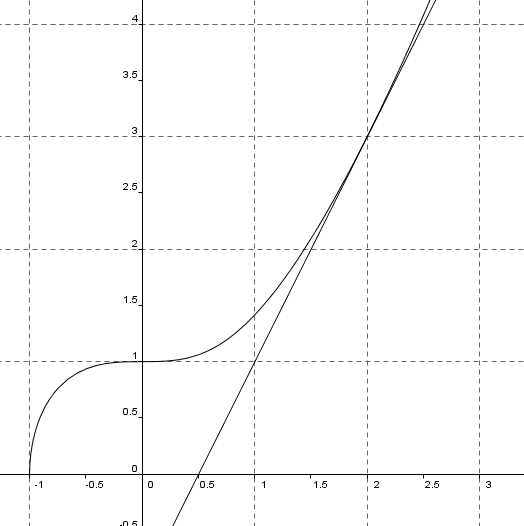 Using transformations of tangent lines is interesting, but seems less concrete and less intuitive to me. Focusing on intervals seems to be at the heart of the idea. Hi Sam, I teach math at Santa Barbara City College in CA. While I’ve always loved my job, I’ve had my passion re-ignited after discovering Robert Talbert’s blog, reading his entire archives, and now working through your entire archives (I’m in mid-2010). (Next is Dan Meyer.) Enthusiasm and ideas like yours are so infectious; they make me want to be a better teacher. I’m just posting to introduce myself (and to request your acceptance of me as a Twitter follower :)). b) Are teaching things to students seeing them for the first time, thus not ruining the “discovery” aspect of cool new ideas for everyone else. Between students that have already seen the content in high school and those taking our course a second time after a failure, more than half our students in any given class are seeing the material for the second or third time, at least at the calc I level and below. As for being jealous of us HS teachers, YAY! I wouldn’t know how I would have to change what I do if some of my kids had seen the majority of the material before. As long as you don’t blame us for the students you get… How many articles I’ve read of college math professors blaming high school teaching? Thanks for reaching out! I’ve been sick all weekend so this was so sweet to read! Hi Jared. If you have the freedom to change up what you do in calculus, there is so much fun you can have! I’ve used lots of activities from Matt Boelkins’ text, Active Calculus (free online). I skip around in the textbook, to put limits later in the course, so we can get to the meaty ideas sooner. The other great blog for calculus ideas is by Bowman Dickson. My blog doesn’t have as many exciting calculus ideas, but I do talk about teaching it at college level. Love this. If you’re looking for a good way of introducing it in a fun way, may I suggest Epic Meal Time’s TurBaconEpic Thanksging (http://youtu.be/7Xc5wIpUenQ) as a fun way of thinking about composed functions! I like this idea, but I do worry some kids will get stuck on “Why did you substitute a y (y=12x-15) in for x (in y=(1/6)x+3/2)?” Perhaps better to call one function x(t) and the other y(x)? Next, we move on to y=sin(x), where x=t^2. And then we do a bunch of examples where they have a graph of some piecewise functions y(x) and x(t) and have to calculate dy/dt. Great post.I like your brilliant idea.Thanks for sharing here.I’ll follow this for my students.Keep updating!! Doing this without limits is an excellent idea, but have you approached the derivative as a rate, ie how much does y change when x changes a bit? This may look a bit symbol burdened, but a diagram should see to that. 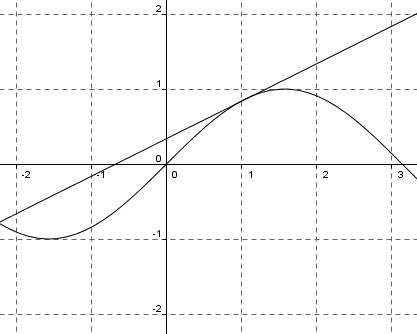 Logically the derivative is not the slope of the tangent to the curve, but the slope of the tangent to the curve can be measured by the derivative. You said you were going to try your approach on the product rule. I don’t think it will work. try the small change in x thing on y = f(x) * g(x) by looking at a rectangle whose sides are of length f(x) and g(x). The function y then describes the area of the rectangle. g ‘(x) * Dx, with a change of area of g ‘(x) * Dx * f(x). Also, I wrote the mathematica code for the graphics demonstration. Would be happy to share it with anyone, just ask.